The brand new release of 26 lots in the 4.7 hectare Steele Park Industrial Estate in Logan Village has attracted a number of local contractors and industrial users who plan to develop facilities and use them as their new premises. Four lots have already been placed on hold. Owned by F & K Pty Ltd, a local civil and construction company, the estate is located at 10 Steele Road and is an extension of the existing Logan Village industrial precinct. Daniel Coburn and Pat Cavanagh of Colliers International have been appointed to market the estate in conjunction with Steve Green and Mark Osmond of Raine and Horne Commercial. Mr Coburn sold the future industry site to F & K Pty Ltd in 2010 for $1.1 million. The land is now subdivided into 26 rectangular shaped lots ranging in size from 1,467 square metres to 4,445 square metres with prices starting from $366,750. “Currently we are doing presales with the titles due to be registered by February next year, so the buyers have the opportunity to sign the contract now and settle early next year,” Mr Coburn said. “In addition to purchasing and selecting their own developers, local owner occupiers can also choose design and construct packages offered by F & K Pty Ltd and Clarks Design and Construct, a Gold Coast based construction firm. 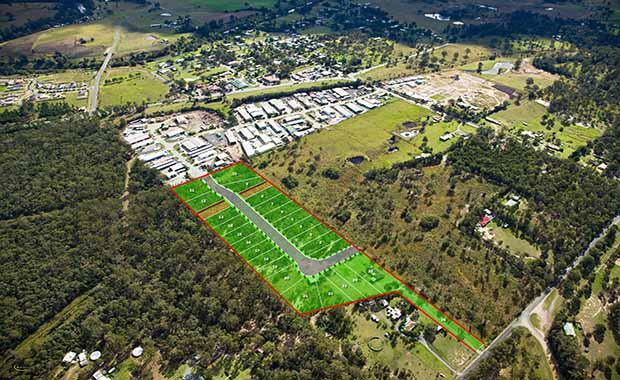 “Logan village industrial precinct is tightly held with no purchase and minimal leasing opportunities in the estate currently so the users are driven to seek property in Yatala, Beenleigh, Loganhome or Meadowbrook. The new Steele Park development will double the size of the Logan Village industrial precinct and meet this demand. “The estate is also attracting strong interest from contractors who are working on the masterplan communities in Lend Lease’s Yarrabilba as well as My Home and the River in Logan Village. He said contractors would be needed in the area over the next thirty years with Lend Lease rolling out a plan to house 45,000 people in Yarrabilba by 2044.